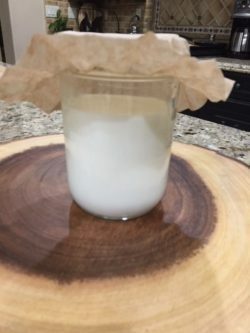 Put your dried grains into a pint-sized mason jar and fill with a half cup of organic milk (not ultra-pasteurized). 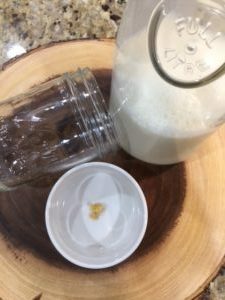 Since Kefir grains feed on lactose (milk sugars), you will need to start with cow’s milk. Once activated, you can then switch to Coconut milk, if you prefer. But make sure to feed your grains every few batches. Cover with a coffee filter and rubber band. Check on it after 4-6 hours. 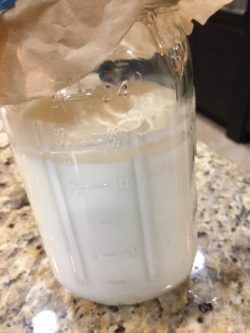 It should start to change the consistency of the milk. Look for a ring around the jar. Once this happens, strain out the milk through a fine mesh plastic strainer. (Kefir doesn’t do well with metal). 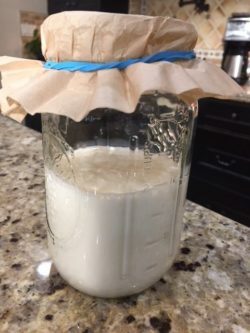 Now add 1 cup of milk to the Mason jar, cover and let sit for 8-12 hours. Check for a change in the milk again. You should see a ring at the milk line. 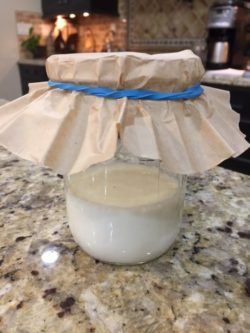 Repeat the above process and add 2 ½-3 cups of milk to the grains and let ferment for 18-24 hours or until the milk starts to thicken (not just leave a ring). Here is what it will start to look like when you know it’s done! 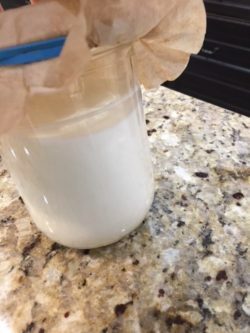 See the thickness of the milk and separation? 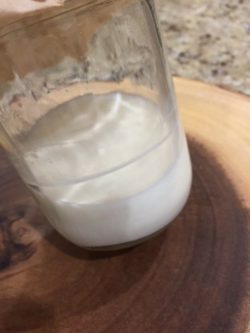 You now have KEFIR! It’s time to strain the grains! 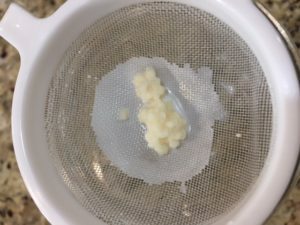 Use a fine meshed plastic strain and a rubber spatula or wooden spoon to work the kefir through the mesh. 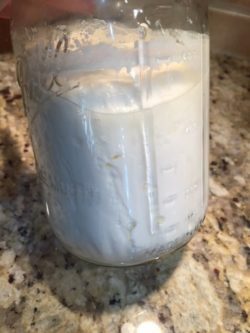 Place the kefir grains in another clean wide-mouthed quart-sized mason jar and add 3 cups of fresh organic milk. Let it ferment for 24 hours or until it is the desired consistency. 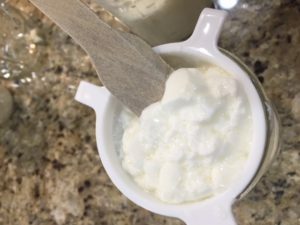 For a daily quart of kefir, REPEAT Step 11!